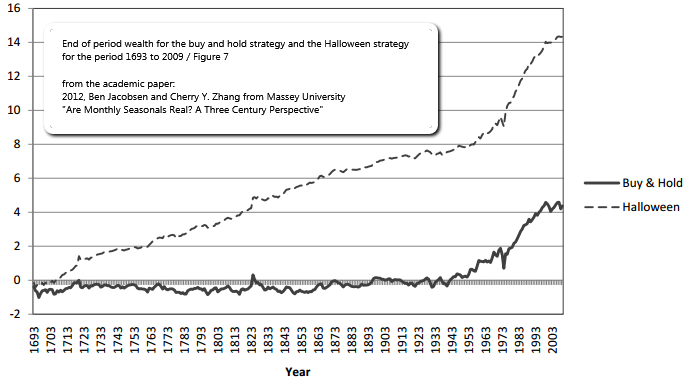 In the following figure from the academic paper an indication of the persistency of the Halloween strategy over time, the authors compare the cumulative annual return over the three centuries. The buy and hold strategy hardly shows an increase in wealth until 1950 (Note that this is a price index and the series do not include dividends). The cumulative wealth of the Halloween strategy increases gradually over time and at an even faster rate since 1950. One remark: Since 1950, being out of the market 6 months from May to October would have avoided major drawdowns, both in depth and in length.